Back Bay Books, 9780316378246, 320pp. A fiercely beautiful novel about one woman's struggle to reclaim a life shattered by betrayal from the 2018 winner of the PEN/ Nabokov Award for Achievement in International Literature. One night, in the dead of winter, a mysterious stranger arrives in the small Irish town of Cloonoila. Broodingly handsome, worldly, and charismatic, Dr. Vladimir Dragan is a poet, a self-proclaimed holistic healer, and a welcome disruption to the monotony of village life. Before long, the beautiful black-haired Fidelma McBride falls under his spell and, defying the shackles of wedlock and convention, turns to him to cure her of her deepest pains. Then, one morning, the illusion is abruptly shattered. While en route to pay tribute at Yeats's grave, Dr. Vlad is arrested and revealed to be a notorious war criminal and mass murderer. The Cloonoila community is devastated by this revelation, and no one more than Fidelma, who is made to pay for her deviance and desire. In disgrace and utterly alone, she embarks on a journey that will bring both profound hardship and, ultimately, the prospect of redemption. 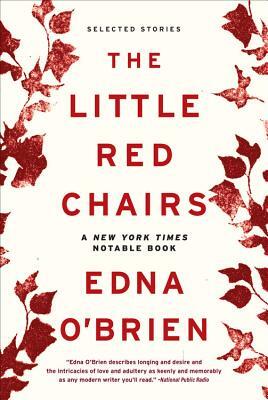 Moving from Ireland to London and then to The Hague, THE LITTLE RED CHAIRS is Edna O'Brien's first novel in ten years -- a vivid and unflinching exploration of humanity's capacity for evil and artifice as well as the bravest kind of love. Edna O'Brien is the author of The Country Girls trilogy, The Light of Evening, The Love Object, and many other acclaimed books. Born and raised in the west of Ireland, O'Brien has lived in London for many years.